Phuket is one of the main departure for Similan islands livebaord. For our Phuket liveaboards we provide FREE Pick up from your hotel in Phuket and back to your hotel at the end of the trip. We have a wide selection of livebaord from budget to luxury liveaboard for all budget and tastes. We have from 2 days to 7 days liveaboards, you can all our departure dates on our website. Phuket is a big city and provide all the convenience and activities a big city can provide. Shopping, luxury resort, party spots, there is as well a lots of nice resort away form the centers where you can get away from the city style. Staying in Phuket is easy for your departure day we will pick you up in the afternoon at your hotel lobby at a given time and then bring you to pier, you get on board in the evening, have diner and cruise by night to the Similan islands. 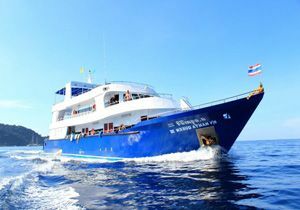 On the way back you will get transfered back from your Phuket liveaboard to your hotel.